Skin absorption is a route by which substances can enter the body through the skin. Along with inhalation, ingestion and injection, dermal absorption is a route of exposure for toxic substances and route of administration for medication. Absorption of substances through the skin depends on a number of factors, the most important of which are concentration, duration of contact, solubility of medication, and physical condition of the skin and part of the body exposed. Skin (percutaneous, dermal) absorption is the transport of chemicals from the outer surface of the skin both into the skin and into circulation. Skin absorption relates to the degree of exposure to and possible effect of a substance which may enter the body through the skin. Human skin comes into contact with many agents intentionally and unintentionally. Skin absorption can occur from occupational, environmental, or consumer skin exposure to chemicals, cosmetics, or pharmaceutical products. Some chemicals can be absorbed in enough quantity to cause detrimental systemic effects. Skin disease (dermatitis) is considered one of the most common occupational diseases. In order to assess if a chemical can be a risk of either causing dermatitis or other more systemic effects and how that risk may be reduced one must know the extent to which it is absorbed, thus dermal exposure is a key aspect of human health risk assessment. In general the rate of absorption of chemicals through skin follows the following scheme from fastest to slowest: Scrotal > Forehead > Armpit≥ Scalp > Back = Abdomen > Palm = under surface of the foot. To be absorbed through the skin, a chemical must pass through the epidermis, glands, or hair follicles. Sweat glands and hair follicles make up about 0.1 to 1.0 percent of the total skin surface. Though small amounts of chemicals may enter the body rapidly through the glands or hair follicles, they are primarily absorbed through the epidermis. Chemicals must pass through the seven cell layers of epidermis before entering the dermis where they can enter the blood stream or lymph and circulate to other areas of the body. Toxins and toxicants can move through the layers by passive diffusion. 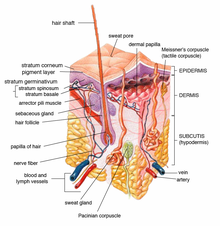 The stratum corneum is the outermost layer of the epidermis and the rate-limiting barrier in absorption of an agent. Thus, how quickly something passes through this thicker outer layer determines the overall absorption. The stratum corneum is primarily composed of lipophilic cholesterol, cholesterol esters and ceramides. Thus lipid-soluble chemicals make it through the layer and into the circulation faster, however nearly all molecules penetrate it to some minimal degree. Absorption of chemicals in municipal water and dental products such as VOC, TTHM, fluoride and disinfectants is a major exposure to environmental health hazards. Agents that injure the stratum corneum, such as strong acids, are absorbed faster than chemicals that do not. Skin damage due to burns, abrasions, wounds and skin diseases also increase absorption. Thus populations with skin damage may be more susceptible to adverse effects of agents that are absorbed through the skin. Certain solvents like dimethyl sulfoxide (DMSO) act as carriers and are frequently used to transport medication through the skin. DMSO increases the permeability of the stratum corneum. Surfactants like sodium lauryl-sulfate increase the skin penetration of water-soluble substances, possibly by increasing the skin permeability of water. Dermal application of a medication or chemical allows treatment to be localized, unlike ingestion or injection. Some medications seem to be more effective (or are more efficient) using the dermal route of administration. Some ingested drugs are heavily metabolized by the liver and may be inactivated, but using a dermal application bypasses this metabolic step allowing more parent compound to enter the peripheral circulation. If a drug is absorbed well through the skin it may be used as a means of systemic medication. Dermal dosage forms include: liniments, braces, lotions, ointments, creams, dusting powders, aerosols, and transdermal patches. Specially designed patches are currently used to deliver fentanyl, nicotine and other compounds. Slower skin absorption versus oral or injectable may allow patches to provide medication for 1 to 7 days. For instance nitroglycerin given transdermally may provide hours of protection against angina whereas the duration of effect sublingually may only be minutes. The amount of chemical that is absorbed through the skin can be measured directly or indirectly. Studies have shown there are species differences in the absorption of different chemicals. Measurements in rats, rabbits or pigs may or may not reflect human absorption. Finding the rate at which agents penetrate the skin is important for assessing the risk from exposures. A chemical may be directly applied to the skin followed by blood and urine measurements at set time points after application to assess the amount of chemical that entered the body. The concentration in the blood or urine at particular time points can be graphed to show and area under the curve and the extent and duration of absorption and distribution to provide a measure of systemic absorption. This can be done in animals or humans with a dry chemical powder or a chemical in solution. Rats are commonly used for these experiments. An area of skin is shaved before the chemical is applied. Often the area of chemical application is covered to prevents ingestion or rubbing off of the test material. Samples of blood and urine are taken at specific time intervals following application (0.5, 1, 2, 4, 10, and 24 hours) and in some protocols at the chosen end time the animal maybe necropsied and tissue samples may also be evaluated for the presence of the test chemical. In some test protocols many animals may be tested and necropsies may occur at set intervals after exposure. Biomonitoring, such as taking urine samples at intervals, from workers exposed to chemicals may provide some information but it is difficult to distinguish dermal from inhalation exposure using this method. The permeability properties of the stratum corneum are, for the most part, unchanged after its removal from the body. Skin that has been removed carefully from animals may also be used to see the extent of local penetration by putting it in a chamber and applying the chemical on one side and then measuring the amount of chemical that gets into a fluid on the other side. One example of this ex vivo technique is the isolated perfused porcine flap. This method was first described in 1986 as a humane alternative to in vivo animal testing. Techniques such as static diffusion cells (Franz cells) and flow-through diffusion cells (Bronaugh cells) have also been used. The Franz Cell apparatus consists of two chambers separated by a membrane of animal or human skin. Human skin is preferred but due to ethical and other considerations is not always available. Human skin often may come from autopsies or plastic surgeries. The test product is applied to the membrane via the top chamber. The bottom chamber contains fluid from which samples are taken at regular intervals for analysis to determine the amount of active that has permeated the membrane at set time points. Bronaugh cells are similar to Franz cells but use a flow-through system beneath the membrane layer and samples of the liquid below are taken continuously rather than at set time points. Bronaugh cells have been replaced with inline cells by some manufacturers. It is sometimes impossible for humane reasons to apply a drug to the skin and measure its absorption. Sarin, a nerve gas, can be absorbed through intact skin and be lethal at low concentrations. Thus if one needs to assess the risk of Sarin exposure one must take skin absorption and other routes into account but one cannot ethically test Sarin on human subjects; thus ways of modeling the risk from skin exposure of the agent have been found. Models are used in some instances to predict the amount of exposure or absorption and to assess public health hazards. In order to assess the risk of a chemical causing a health issue one must assess the chemical and the exposure. Exposure modeling depends on several factors and assumptions. The surface area of skin exposed. The surface area of an adult is about 20,900 cm2 and the surface area of a child of 6 years is about 9,000 cm2. These figures and figures for other body parts or portions can be found in the EPA Exposures Handbook 1996 or estimated using other databases. The permeability coefficient of the chemical (how easy it is for the chemical to get through the skin). This may be estimated using an octanol-water partitioning coefficient (a measurement of the uptake from aqueous solution into powdered stratum corneum). The weight of the person. Standard weight of an adult 71.8 kg, a 6-year-old child 22 kg and female of child-bearing age 60 kg are generally used. To calculate the dose of chemical a person is exposed to one must multiply the surface area of the skin exposed by the concentration of the chemical in the substance that comes into contact with the skin by the time in contact by the permeability coefficients and any unit conversion factors needed then divide by the weight of the person. concentration of chemical x surface area exposed x permeability coefficient / body weight. Models for this can be found in the EPA Standard operating procedures for residential exposure assessment. These models establish guidelines for estimating pesticide exposure so that one can judge the risk and take appropriate actions if the risk is judged to be too great given the exposure. This can be modeled similarly to the dry chemical but one has to take into account the amount of solution the skin comes into contact with. Three scenarios for exposure to chemicals in solution have been proposed and modeled. a. A person could be exposed partially to a solution for a period of time. For instance if one stood in contaminated flood water for a period of time, or one worked in a situation where the hands and lower arms were immersed in a solution for a period of time. This type of scenario depends on the skin area exposed and the duration of exposure as well as the concentration of the chemical in the solution. One may have to adjust the absorption coefficients for the different area of the body as the feet are more callused on the bottom and will allow less chemical through than the lower leg. The rate of absorption of chemicals follows the following general scheme from fastest to slowest: Scrotal > Forehead > Armpit≥ Scalp > Back = Abdomen > Palm = under surface of the foot. The dermal absorption of a dilute solution by partial leg or arm exposure has been modeled by Scharf. The EPA also has guidance on calculating the dermally absorbed doses of chemicals from contaminated water. Dermally absorbed dose rate = concentration in water x surface area exposed x exposure time x permeability coefficient x conversion factors. b. The second scenario is total body immersion, such as swimming in a pool or lake. Exposure in Swimming pools is only partially dermal and a SWIMODEL has been proposed This model takes into account not only the skin exposure but also considers ocular, ingestion, inhalation, and mucous membrane exposure that may occur due to being totally immersed. A second model dealing primarily with skin absorption was created by Scharf to assess the risk of overspray of pesticide from aerial spraying on swimming pools. These models use whole body surface area rather than the surface area of specific parts for the mathematical input. This is a minor contributor and has been ignored in most risk assessments of chemicals as a route of exposure for gaseous or aerosolized toxicants. More research is needed in this area. If skin exposure and absorption are deemed to indicate a risk various methods to reduce absorption can be undertaken. Labels of chemicals can be adapted to require the use of gloves or protective clothing. Warnings to wash immediately if the chemical comes into contact with skin can be made. Close pools or lakes to swimmers. Limit the exposure time to chemicals, i.e. workers can only work with certain chemicals for a certain length of time per day. ^ Workplace Safety & Health Topics: Skin Exposures & Effects. CDC. Retrieved April 17, 2014. ^ a b Eaton, DL and Klaassen Curtis D. Principles of Toxicology. in Cassarett & Doull's Toxicology, The Basic Science of Poisons. 5th edition. 1996. McGraw-Hill. ^ Bos, JD; Meinardi, MM (2000). "The 500 Dalton rule for the skin penetration of chemical compounds and drugs". Exp. Dermatol. 9: 165–9. doi:10.1034/j.1600-0625.2000.009003165.x. PMID 10839713. ^ a b c d e Baynes, RE and Hodgson E. Absorption and Distribution of Toxicants. in Chapter 6 of A Textbook of modern toxicology. 3rd edition. 2004, John Wiley & Sons, Inc.
^ Morganti, P., Ruocco, E., Wolf, R., & Ruocco, V. (2001). "Percutaneous absorption and delivery systems." Clin Dermatol. 19: 489-501. ^ Hood, Ernie. “Tap Water and Trihalomethanes: Flow of Concerns Continues.” Environmental Health Perspectives 113.7 (2005): A474. Print. ^ Gabler WL: Absorption of fluoride through the oral mucosa of rats. Arch Oral Biol 1968; 13:619-623. ^ a b Baggot JD. Disposition and Fate of Drugs in the Body. Chapter 5 in Veterinary Pharmacology and Therapeutics, 6th edition, 1988 Iowa State Press, Ames. ^ Booth NH, Topical Agents. Chap 44 in Veterinary Pharmacology and Therapeutics, 6th edition, 1988 Iowa State Press, Ames. ^ Davis, LE. Drug presentation and prescribing. Chap 3 in Veterinary Pharmacology and Therapeutics, 6th edition, 1988 Iowa State Press, Ames. ^ Shargel, L and Yu, A. Chapter 11. Modified-release drug products and drug delivery systems. in Applied Biopharmaceuts and Pharmacokinetics. 3rd edition. 1993 Appleton & Lange. ^ a b c Scharf, JE; et al. (2008). "Dermal absorption of a dilute aqueous solution of malathion". J. Emerg. Trauma Shock. 1: 70–73. ^ a b World Health Organization, Enivironmental Health Criteria 235, Dermal Absorption, 2006. ^ Riviere JE et al. The isolated perfused porcine skin flap (IPPSF). I. A novel in vitro model for percutaneous absorption and cutaneous toxicology studies. Fundam Appl Toxicol. 1986 Oct;7(3):444-53. ^ Dressler WE (1999) Hair dye absorption. In: Bronaugh RL & Maibach HI eds. Percutaneous absorption: drugs–cosmetics–mechanisms–methodology, 3rd ed. New York, Marcel Dekker, pp 685–716 (Drugs and the Pharmaceutical Sciences Vol. 97). ^ Bronaugh, R.L. ; Stewart, R.F. (1985). "Methods for percutaneous absorption studies. IV. The flowthrough diffusion cell". J. Pharm. Sci. 74: 64–67. doi:10.1002/jps.2600740117. ^ Yu, CY et al. Human body surface area database and estimation formula. Burns. 2010 Aug;36(5):616-29..
^ Wester; et al. (1987). "In vivo and vitro binding to powdered human stratum corneum as methods to evaluate skin absorption of environmental chemical contaminiants from ground and surface water". J Toxicol Environ health. 21: 367–374. doi:10.1080/15287398709531025. ^ US Enivironmental Protection Agency. Risk Assessment Guidance for Superfund. Volume I: Human Health Evaluation Manual (Part E, Supplemental Guidance for Dermal Risk Assessment)-Final. Washington, DC: US EPA, Office of Superfund Remediation and Technology Innovation, EPA/540/R/99/005, OSWER 9285.7-02EP, July 2004. ^ Gujral, J. S.; Proctor, D. M.; Su, S. H.; Fedoruk, J. M. (2011). "Water Adherence Factors for Human Skin". Risk Analysis. 31: 1271–1280. doi:10.1111/j.1539-6924.2011.01601.x. ^ Rauma M. et al. Predicting the absorption of chemical vapours. Adv Drug Deliv Rev. 2013 Feb;65(2):306-14. doi: 10.1016/j.addr.2012.03.012. Epub 2012 Mar 21.